This is a quick overview of where to find the "law." This article is divided by the branches and levels of government. There are usually multiple sources of law that must be considered at the same time. It is important to read all of the available law on the subject you are interested in from all different sources. It is also important to look at how laws at different levels of government interact with each other. When you are starting to research a legal topic, it is often a good idea to start by using a secondary source. The secondary source will explain how the different sources of law relate to each other. The federal legislative branch is called the Congress and it consists of the Senate and the House of Representatives. Its responsibility is to make the laws (statutes) of the United States. More on how the House of Representatives creates laws. More on how the Senate creates laws. The laws of the United States are found in the U.S. Code. The Code is divided into 50 different titles covering many subjects. Learn more about the U.S. Code. The United States Government Printing Office (GPO) maintains a database of the text for all public and private laws. Search Public and Private Laws from 1995-1996 to present. Learn About Public and Private laws. The Congressional Record is the official record of the proceedings and debates in the House and Senate. Search Congressional Record issues from 1989 to the present. Learn more about the Congressional Record. More on the Legislative Branch. When a member of Congress introduces a bill, the bill text itself may be found in several places. The least expensive and fastest way to find bills is by using the Congressional website, Thomas, which has archived bills since the 101st Congress in 1989. The executive branch of the Federal Government is responsible for enforcing the laws made by Congress. Its agencies and departments make regulations to implement and enforce the laws. Once a year, all federal regulations are compiled into the Code of Federal regulations (CFR). This Code is divided into 50 titles representing a variety of subjects. Browse and Learn more about the CFR. Proposed and final regulations, executive orders, and other executive documents are first published in the Federal Register. Search and Browse the Federal Register issues from 1994 to the present. The Federal Register is the official publication for the federal government’s administrative agencies. It is published every business day and includes updates, rules and proposed rules as well as notices. Once each year the information is compiled into volumes called the Code of Federal Regulations. If you see a legal citation that looks like this -- 20 CFR § 416. 112 -- this means that you are being referred to title 20 of the Code of Federal Regulations, Section 416.112. There are 50 titles and the CFRs are updated once each year, which means that any changes since that date will be in the Federal Register. To be accurate, you should look at the CFR and the Federal Register. Each volume of the CFR is revised once each calendar year and is issued on a quarterly basis. The judicial branch is responsible for interpreting the laws enacted by Congress. Judges may interpret a law or statute by considering the intent or goal of the legislature that created and passed the law. These interpretations and other judicial decisions are called Common Law or judge made law. Common law is usually found in documents called Opinions. Judges use Opinions and the rules of law established in them, called precedent, to decide the present issues in the cases they hear. The federal district courts are the courts where federal cases are filed first. There are 94 federal judicial districts. The Districts are organized into 13 circuits: 11 regional Circuits, the D.C. Circuit, and the Federal Circuit. Each Circuit has a U.S. Court of Appeals to hear appeals from the District Courts located within their circuit. Search case opinions for United States District Court for the District Maryland. Search the court rules for United States District Court for the District Maryland. Court cases in the federal system are appealed to one of the 13 United States Circuit Courts of Appeals. Maryland is in the 4th Circuit. More about the Circuit Courts of Appeals. Search case opinions for the 4th Circuit. Search rules and procedures for the 4th Circuit. The United States Supreme Court only accepts cases of the highest importance. More about the Supreme Court. Search Case opinions for the Supreme Court. Search rules and procedures for the Supreme Court. Outline of the structure of the federal court system. The Legislative Branch is called the General Assembly and it consists of the Senate and the House of Delegates and is responsible for making the laws (statutes). Learn how bills become laws in the MD General Assembly. 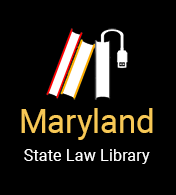 The Maryland Code (from Michie's Legal Resources) contains the laws of the State of Maryland. "Annotations" are legal research aids that can be found after each section of a law. Legal publishers do some of the legal research for you. Annotations often list certain important case law decisions from the past that mention the section of the law you are looking at. Sometimes, the annotations will describe the history of how different laws have evolved into the section of law you are looking at. Annotations are an important starting place for your legal research. You can read these decisions to see how judges have applied this section of the law in certain situations. Reading these new decisions will help you to understand how different courts may have decided what this section of the law means. Annotated Code of Maryland: Sessions are arranged by subject or "codified" and placed in a volume of the Code. Tip: Some volumes are republished; others get a pocket part or supplement. Maryland Code is in the process of being revised: "Red" volumes and "Black" volumes. Maryland Code in print: Red Volumes have titles, ex: "Real Property" and Black volumes are arranged by Article Number. The executive branch of the state government contains a variety of agencies and departments that make regulations to help implement Maryland law. Not all states list their administrative regulations on the internet. Twice a year, all state regulations are compiled into the Code of Maryland Regulations (COMAR). This code is divided into 35 titles representing a wide range of subjects. COMAR includes many documents "incorporated by references." This means that the documents are not included in the COMAR text but that it is officially part of the COMAR. Proposed and final regulations, executive orders, Attorney General opinions, and agency hearing and meeting notices are published in the Maryland Register. The judicial branch is responsible for interpreting the laws made by the General Assembly. It handles civil and criminal court cases. State Judges make their decisions based on what they believe was the state legislature's intentions for enacting the law. State rules and regulations may differ from those of the Federal government; however, they may not undermine federal authority. Do not overlook the importance of the rules (procedures) required by the state courts. If one does not follow the proper procedures, your case can be dismissed without having your "day in court." Therefore, it is important that you read and understand the rules of the courts and follow them. The Md District Courts handle landlord-tenant cases, motor vehicle, misdemeanors, some felonies, and all civil cases for amounts less than $5000. District Court opinions are not found online. The Md Circuit Courts handle all major civil cases, most serious criminal matters, and appeals from the District Court. The Md Court of Special Appeals reviews appeals from the Circuit Courts. The Md Court of Appeals is the highest court in Maryland and hears only the cases it deems most important. Local government legislatures consist of city and county councils. Their job is to make local laws and ordinances. There are twenty-four main local jurisdictions in Maryland (twenty-three counties and one municipality Baltimore City) In addition, one-hundred-fifty-seven(157) towns and cities have their own governments. All cities and counties in Maryland maintain a code of their local laws and ordinances. Many of these codes cannot be found online. However, here are some tips on starting your search for local codes. It is a good idea to search the website of your particular city or county for information on where to find their legal codes. The executive branch of city or county governments make some regulations to help implement local laws. These regulations are usually not found online. To find more specific information on local regulations, it is best to go to the city or county website. A list of these sites can be found here. Local governments do not maintain separate court systems.